My itinerary said: “20th of October – Travel to Cancun via Chichen Itza.” Cancun: the latest tourist capital of Mexico. Chichen Itza: the first Mayan ruins I was about to visit. I entered a taxi. Ten minutes later, as if remembering something important he ought to have told me earlier, the taxi driver said in broken English: “You sure want go Cancun? Hurricane go there!” He turned around, picked up a newspaper from the back seat, and handed it to me. I couldn’t believe my eyes: A huge, impressive color photo covered half the front page. It looked like an enormous spiral galaxy, just like the one in which our solar system is situated! “That’s Wilma,” he said. “Wilma, the galaxy?” I almost replied. “Wilma, big hurricane!” he added with emphasis. Well, the main title below was perfectly clear: “Wilma viene con furia!” (“Wilma approaches with fury!”) “But no problem,” the driver continued, in an attempt not to lose the ride. “Not exactly pass over Cancun. Centro Wilma will be 10 kilometros in the sea, in Gulf of Mexico. Expertos say she hit tonight,” he said in broken English well-spoken. It took me a few minutes to quite absorb it. Here I was, heading towards Cancun on the same day that a huge spiral galaxy decided to make its way to the same location. What was this? I could not rationalize, for suddenly I started imagining myself moving from the edges of our galaxy towards its center. “If only the center wouldn’t be in the ocean,” I almost mumbled to myself. And then I spit it out: “Well, let’s go then!” I couldn’t believe my own ears – did I just say that?! I already felt it; the invisible forces that compelled me were beyond my control. In one of those rare moments in life, I started seeing fate spinning its web around my days. Yet this was no ordinary fate – it was a truly God-sent gift. Wilma was traveling to meet me. 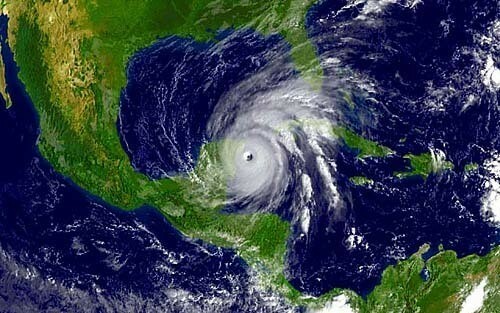 A real hurricane! Coming from a Mediterranean island, I had never experienced one. I had only seen its distant images and faint echoes on TV. Was it a coincidence that I had just finished reading the book The Darkness of God, which explored the antinomian nature of Yahweh, the Jewish God? And was it a coincidence that on this same day, on the way to Cancun, I would see the fearful sculpted images of Chac, the Mayan god of thunder and rain, covering the walls of the temples in Chichen Itza? Chac, with his long curling snout, reptilian eyes, and huge scary fangs, was a potent and palpable reminder of the dark side of Yahweh. My deepest wishes were not to remain unfulfilled. For, as it often happens, the weather experts and the taxi driver were wrong. A few hours after I had checked into a hotel in Cancun, the latest news was that Wilma had slightly shifted her course, and her center would pass over the town. I already had the feeling that I was truly approaching the center of our galaxy. My hotel, where I was to be willingly trapped for the next five days, had the most interesting and odd space-travelers! I had never met such a fascinating collection of characters in my life up to that point or since: There was a drug-dealer-turned-Christian-missionary (the only other person apart from me who was fascinated by the prospect of enjoying the spectacle); a Ukrainian couple who had emigrated to the United States after traveling around the world; a group of young Russian Staroveris (Old-Believers) living in Oregon, USA – with the men wearing long beards and the women head-scarves; one of the 1,500 inhabitants of Norfolk Island in the South Pacific; a Jew from Munich; a Swiss professor who seemed to have all the possible survival skills and equipment; Carlos the crazy Mexican – the list had no end. Wilma was a little late, but faithful to our predestined meeting. And what an encounter it was! At midnight on the 21st, she hit with all her mighty destructive force. And I was right in her center, elated to see, hear, and feel the divine force that moves the cosmos. I could see it transforming itself into mighty thunder, torrential rain, powerful winds that felled trees like matchsticks. But above all, I felt Wilma on my bare skin. Like her lover, I stood alone in the street and let the wind carry me aside. I went outside to the hotel’s open courtyard and let the pouring rain soak me. I approached the bending branches of the huge palm tree and felt Wilma’s overpowering strength consume me. But that is not all. Wilma also introduced me to the mystery of the darkness of God – the destructive power of the divine that is sometimes called the wrath of God. For the power that runs the show of our lives is a two-headed entity: With one head it destroys so that with the other it may create anew. Destruction is the foundation of the never-ending creative process that renews itself out of its own bipolar nature. The Jewish Yahweh, to whose irrational might the biblical Job was to bow, would be forever united in my imagination with the Mayan god of thunder and rain, Chac. Bearing so many different names, the god of destruction, decomposition, decay, chaos, would show me his frightful fangs in the heart of the Mayan World, where some of his most magnificent temples were constructed to honor him for all eternity. Yet, not for a second did I feel any fear. Quite the contrary; I was dazzled by the beauty of this force, the magnitude of which I had never before experienced. I was mesmerized by its infinite potential to destroy. I was overwhelmed by the simplicity, even the harmony, of its destructive might, which at times seemed to create works of art and music of infinite depth, of which our eyes can see but a small part and to which our ears can only imperfectly attune. The center of the galaxy came to me. Chac showed me his mighty fangs. Wilma and I met, bonded, and parted. My book Destination Earth – A New Philosophy of Travel by a World-Traveler will be coming out soon. For this reason, this Tuesday Letter is an excerpt from the book. 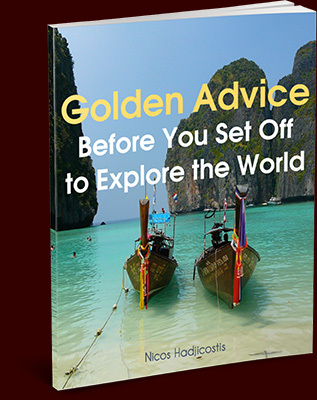 The essay is one of the book’s 23 travel stories that together with the photos enrich and complete the main narrative. It was written in the first year of my journey, so it has the freshness and enthusiasm of the nascent world-traveler.